BlueLinx locations in Lake City, Fla. and Elkhart, Ind. 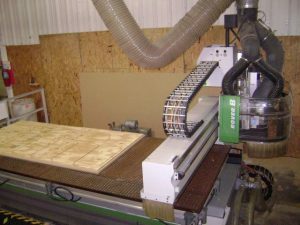 offer a wide array of custom cutting and fabrication services for the wood products industry. We specialize in hardwood and softwood lumber as well as many panel products such as plywood, OSB, particle board, MDF, melamine and many others. We offer complete custom solutions for lean manufacturing and just-in-time inventory management. Ship us your wood for cutting or leverage the BlueLinx buying power to provide a complete turnkey solution. We offer much more than world-class distribution and quality products: When you need certified green products, look to BlueLinx. With a rapidly growing focus on green, we now offer a wide assortment of certified green products such as FSC, SFI, formaldehyde free, EPP and many more. In addition to our certified products, members of our staff are certified lumber graders for softwood, hardwoods and heat-treated services. We are very proud that our Lake City, Florida and Elkhart, Indiana facilities are among a select group of locations to receive OSHA VPP recognition. We take pride in the safety of our people and the quality of our products. Experience the advantages of doing business with BlueLinx. Certifications are reported by manufacturer and not independently verified by BlueLinx.